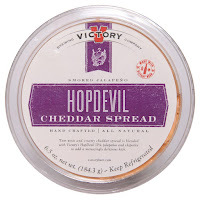 The Wine and Cheese Place: Cheese spreads made with Victory Brewing beer! Our beer-infused, hand-crafted cheddar spreads merge specialty Wisconsin cheddar with Victory beer and fresh ingredients, creating both simple and complex flavors to please any palate. This bold and creamy cheddar spread is blended with Victory’s HopDevil IPA, jalapeños and chipotles to add a Menacingly Delicious kick. Our beer-infused, hand-crafted cheddar spreads merge specialty Wisconsin cheddar with Victory beer and fresh ingredients, creating both simple and complex flavors to please any palate. 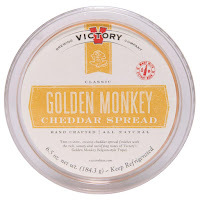 This classic creamy cheddar spread finishes with the rich, savory and satisfying notes of Victory’s Golden Monkey Belgian-style Tripel.